We encourage practitioners to use formative data and assessment to improve instruction (see our Assessment page), and do the same to assess our own work. This helps us get results that show that we close racial and income gaps in Kindergarten, and that our Pre-K program has some of the largest effects seen to date. Biannual independent evaluations and district-mandated assessments that evaluate each child’s growth. Formative assessments which help teachers track student progress. Findings from the ExCEL study, a five-year longitudinal study funded by the Institute of Educational Sciences to evaluate all aspects of our program from Pre-K through third grade. These findings provide further longer-term evidence around the effectiveness of our Pre-K (K1) program and help the Department of Early Childhood identify how to further improve our curriculum and the supports we provide our educators. Nationally, this study will help understand the challenges of sustaining the Pre-K gains. Feedback from teachers, paraprofessionals, and administrators. Below you will find information on our landmark Pre-K study, how we achieve strong student outcomes in the short-term, how we sustain the gains over the long-term, and finally, selected research articles about our work. Interested in more, or seeing Focus on Early Learning in action? Contact us! Internal and independent studies reveal that enrolling in BPS earlier than kindergarten (K2) has positive effects on student performance in both the short and long terms. The positive effects of Pre-K (K1) programs on student achievement apply to all students, including English Language Learners and students with disabilities. Students who qualify for free or reduced lunch who participate in BPS Pre-K outperform students who do not qualify for free or reduced lunch and who do not participate in BPS Pre-K. Upon entering Kindergarten, students who participated in the BPS Pre-K program were 50% more likely to be “ready for kindergarten”than students who did not participate, as measured by the benchmark assessment tests offered at the start of the school year. Seventy-six percent of students who participated in BPS Pre-K programs scored at or above benchmark upon entering Kindergarten, compared to 51 percent of students who did not participate. Only 11 percent of students who participated in BPS Pre-K programs were “well below benchmark” at the beginning of their Kindergarten school year, compared to 30 percent of students who did not participate in Pre-K.
80 percent of African-American students who participated in the BPS Pre-K program reached benchmark levels upon entering Kindergarten, compared to 56 percent of students who did not. 70 percent of Hispanic/Latino students who participated in the BPS Pre-K program reached benchmark levels upon entering Kindergarten, compared to 39 percent who did not. 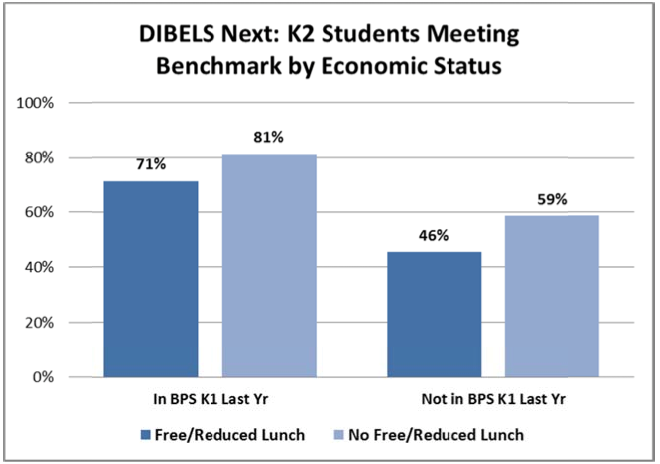 Among students who qualified for free-or-reduced-price lunch, 71 percent who participated in a BPS Pre-K program scored at or above benchmark when they entered Kindergarten, compared to 46 percent who did not. Among students who have a disability, 57 percent who participated in a BPS Pre-K program scored at or above benchmark when they entered Kindergarten, compared to 41 percent who did not. 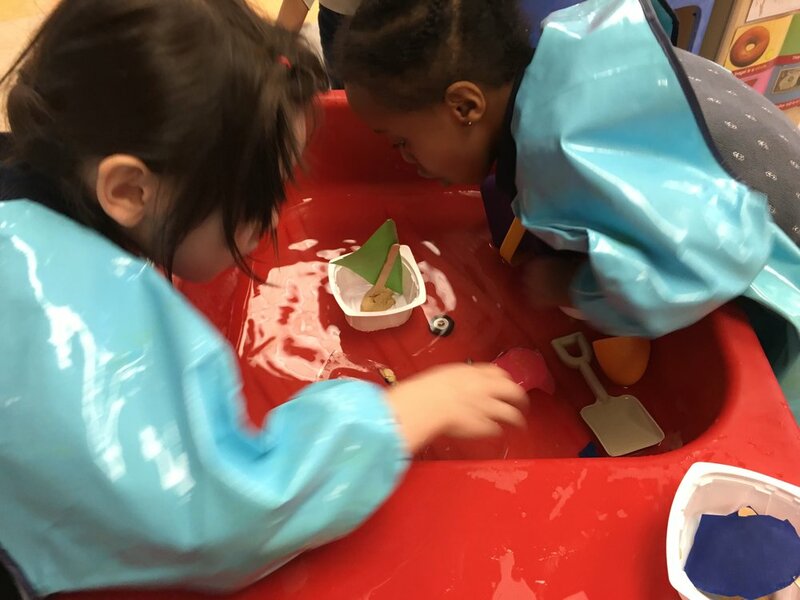 Sustaining the Gains - Overcoming the "Fade Out Effect"
Students who attended our BPS Pre-K program outperform their peers on standardized state tests, years after their Pre-K attendance. This is counter to the "fade out effect" in which gains made in the Pre-K year appear to disappear quickly, in some cases in as little as a a year. See the tables below, and click here for a more detailed look at grade 3. Students who attended BPS Pre-K outperformed their peers on the state mathematics exam in grade 5. Students who attended BPS Pre-K outperformed their peers on the state English Language Arts (ELA) exam in grade 3. Playing, Talking, Co-constructing: Exemplary Teaching for Young Dual Language Learners Across Program Types (Early Childhood Education Journal), June 2018 (highlights BPS dual language classrooms). Preschool Curricula and Professional Development Features for Getting to High-Quality Implementation at Scale: A Comparative Review Across Five Trials (AERA Open), March 2018 (highlights our “strongest hope” PD, coaching, curricula model). Summer Boost: Challenges and Opportunities in Summer Programs for Rising Kindergarten Students (MDRC), October 2017 (highlights Summer Early Focus). Massachusetts Released Progress Report on First Year of Preschool Expansion Initiative: Program Shows Positive Results (Massachusetts EEC), February 2017. See also: PEG webpage. The Current State of Scientific Education on Pre-Kindergarten Effects (Brookings Institute), April 2017 (also see: Consensus Statement). Case Studies of Schools Implementing Early Elementary Strategies: Preschool Through Third Grade Alignment and Differentiated Instruction. BPS was one of five sites chosen nationally, represented by the Baldwin and Clap Schools. (Results in Brief; Full Report; U.S. Dept. of Education; Article from New America), December 2016. Starting Young: Massachusetts Birth-3rd Grade Policies that Support Children's Literacy Development [Boston is featured] (New America; see also: summary article), November 2015. Restoring Opportunity: A Systems-Level Perspective on the Role of Research in Supporting Schools to Overcome Achievement Gaps (SREE: Society for Research on Educational Effectiveness; Panel) (Abstract, Program), September 2014. The Essential Elements of High-Quality Pre-K: An Analysis of Four Exemplar Programs (Jim Minervino, Ready On Day One, Gates Foundation), January 2014. Innovative & Effective Utilization of Early Childhood Data - SLDS Webinar (Institute for Education Sciences), June 2011.